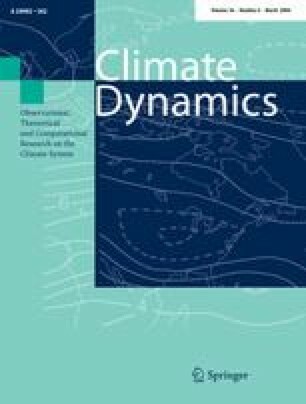 The modelled El Niño–mean state–seasonal cycle interactions in 23 coupled ocean–atmosphere GCMs, including the recent IPCC AR4 models, are assessed and compared to observations and theory. The models show a clear improvement over previous generations in simulating the tropical Pacific climatology. Systematic biases still include too strong mean and seasonal cycle of trade winds. El Niño amplitude is shown to be an inverse function of the mean trade winds in agreement with the observed shift of 1976 and with theoretical studies. El Niño amplitude is further shown to be an inverse function of the relative strength of the seasonal cycle. When most of the energy is within the seasonal cycle, little is left for inter-annual signals and vice versa. An interannual coupling strength (ICS) is defined and its relation with the modelled El Niño frequency is compared to that predicted by theoretical models. An assessment of the modelled El Niño in term of SST mode (S-mode) or thermocline mode (T-mode) shows that most models are locked into a S-mode and that only a few models exhibit a hybrid mode, like in observations. It is concluded that several basic El Niño–mean state–seasonal cycle relationships proposed by either theory or analysis of observations seem to be reproduced by CGCMs. This is especially true for the amplitude of El Niño and is less clear for its frequency. Most of these relationships, first established for the pre-industrial control simulations, hold for the double and quadruple CO2 stabilized scenarios. The models that exhibit the largest El Niño amplitude change in these greenhouse gas (GHG) increase scenarios are those that exhibit a mode change towards a T-mode (either from S-mode to hybrid or hybrid to T-mode). This follows the observed 1976 climate shift in the tropical Pacific, and supports the—still debated—finding of studies that associated this shift to increased GHGs. In many respects, these models are also among those that best simulate the tropical Pacific climatology (ECHAM5/MPI-OM, GFDL-CM2.0, GFDL-CM2.1, MRI-CGM2.3.2, UKMO-HadCM3). Results from this large subset of models suggest the likelihood of increased El Niño amplitude in a warmer climate, though there is considerable spread of El Niño behaviour among the models and the changes in the subsurface thermocline properties that may be important for El Niño change could not be assessed. There are no clear indications of an El Niño frequency change with increased GHG. I am grateful to Pascale Delecluse, Julia Slingo, Matthieu Lengaigne, Alexey Fedorov, Jo Brown, Krishna AchutaRao and Pascale Braconnot for fruitful discussions, to Pascal Terray for help with the statistical computations, and to Jerry Meehl and Geert Jan van Oldenborgh for improving the original manuscript. I acknowledge the international modelling groups for providing their data for analysis, the Program for Climate Model Diagnosis and Intercomparison (PCMDI) for collecting and archiving the model data, the JSC/CLIVAR Working Group on Coupled Modelling (WGCM) and their Coupled Model Intercomparison Project (CMIP) and Climate Simulation Panel for organizing the model data analysis activity, and the IPCC WG1 TSU for technical support. The IPCC Data Archive at Lawrence Livermore National Laboratory is supported by the Office of Science, U.S. Department of Energy. The support of the European Union’s Framework Programme VI via the DYNAMITE project (contract #003903) is also acknowledged. NCEP Reanalysis data was provided by the NOAA-CIRES Climate Diagnostics Center, Boulder, Colorado, USA, from their Web site at http://www.cdc.noaa.gov/.